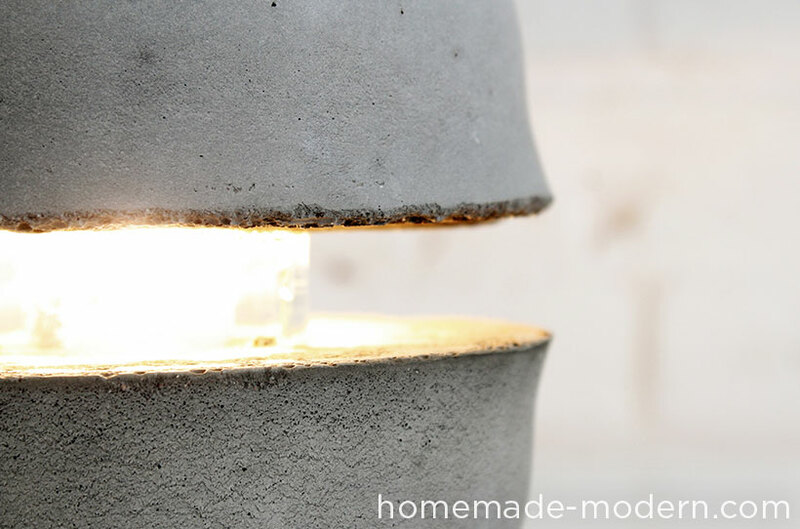 This is a super easy concrete DIY project. 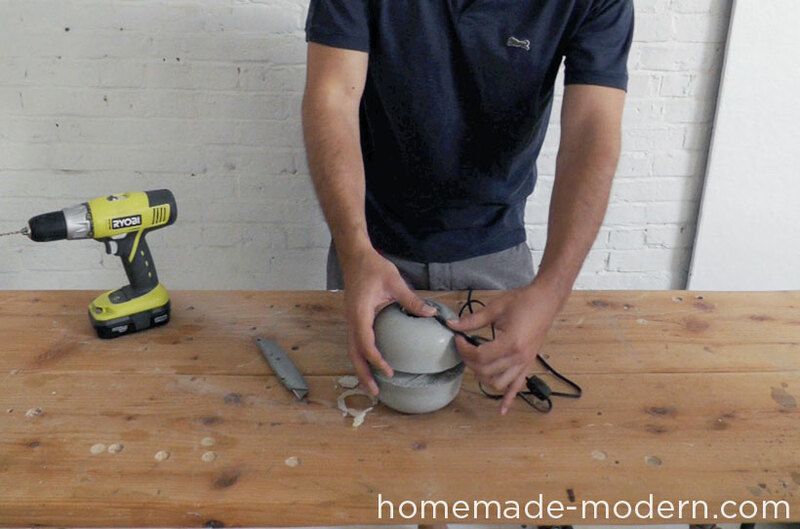 Use basic cereal bowls to form Quikrete cement mix into a futuristic-looking space pod of a lamp. I used a small preserves jar. Try to pick a jar that is big enough to hold a small light bulb but not so long that the two bowls of concrete will be too far away from each other. Make sure the socket and lightbulb will fit inside your glass jar. I used 2 porcelain bowls that I purchased at a thriftstore. Plastic bowls with a little bit of flexabilty could also work since it'd be easier to remove the concrete. QUIKRETE® 5000 Concrete Mix is a commercial-grade blend of stone or gravel, sand, and cement and is specially designed for higher early strength. This is the recommended concrete mix to use because of the high early strength and low price. 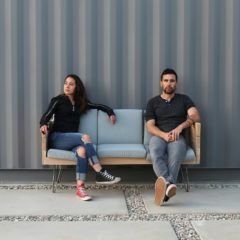 It’s great for making tables, pavers, stools, and lamps and is typically found in 80-pound bags at Home Depot, but 60-pound bags are also available. QUIKRETE® Countertop Mix is a super high-performance mix that is worth the price. 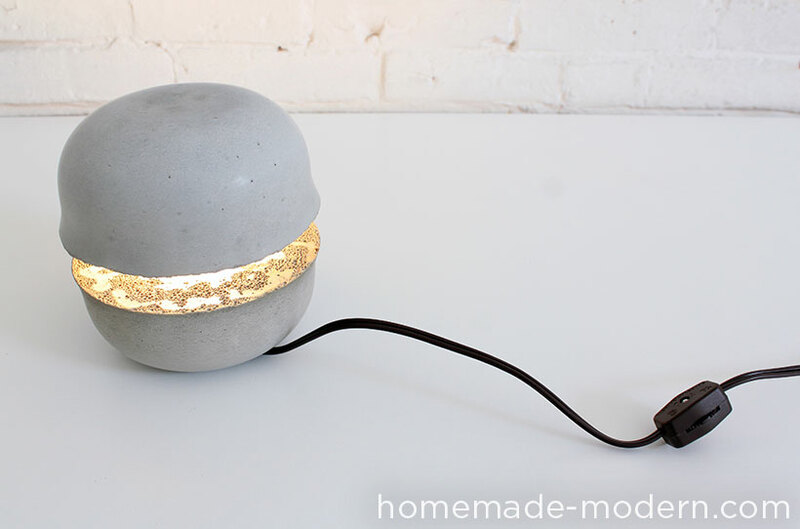 It has no large pieces of gravel or aggregate, which makes it great for small intricate pieces such as lamps and vases. It’s easy to work with and comes in different colors. Most stores don’t carry it in-stock so call ahead to your local Home Depot to have it ordered for pickup. Place the jar, lid side down, in the bottom of the bowl and draw a ring around it with a pen. Make a generous ring of glue right on tip of the outline you just drew. It should be about 1/4" high. Make an additional line of glue about 3/4" long that goes out from the ring. This line will create a channel in the concrete that will house the electrical cord. Press the jar firmly into the glue, but not so hard that it pushes through and hits the bowl. You want the jar to rest on the ring of glue. 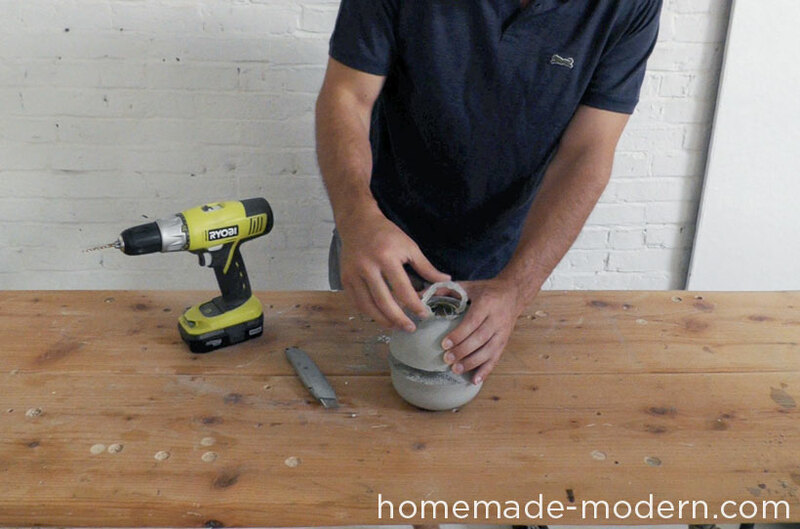 Mix the concrete and spoon it into the bowl. 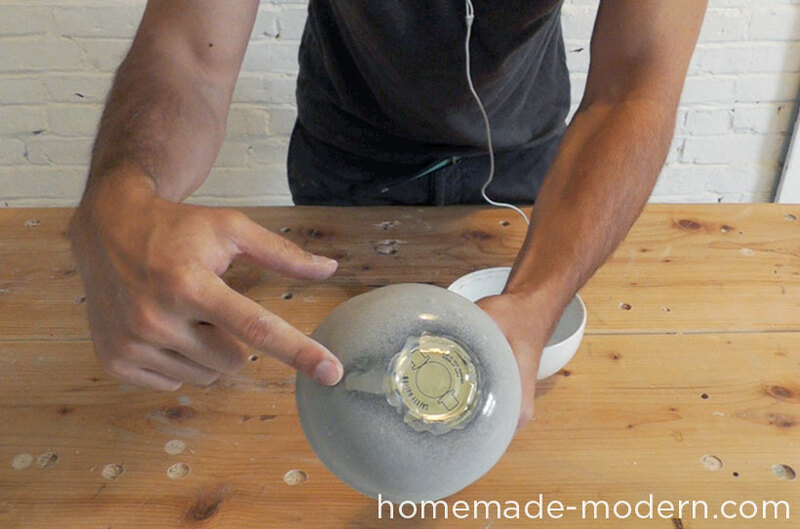 Vigorously vibrate the bowl to get all the air bubbles out of the concrete. Let the concrete cure for at least 20 hours. Since the bowl I used wasn't flexible, I waited 48 hours. I twisted the jar and removed the concrete from the bowl. 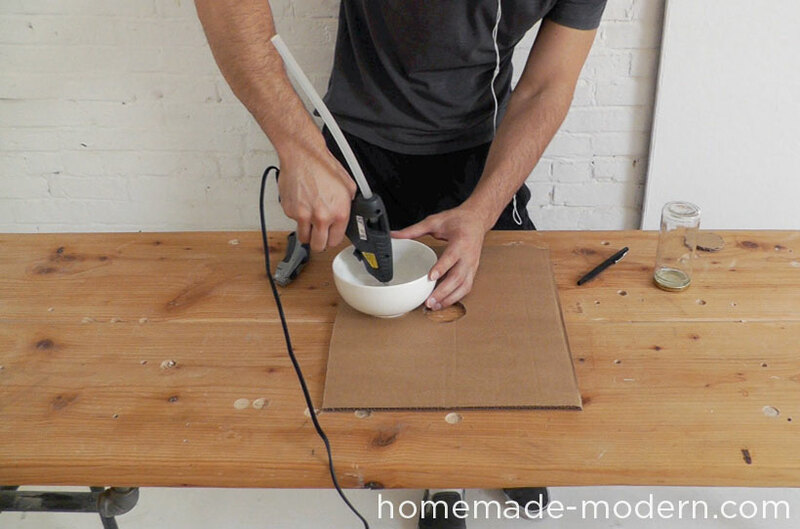 If you use a plastic bowl, this step would be even easier. 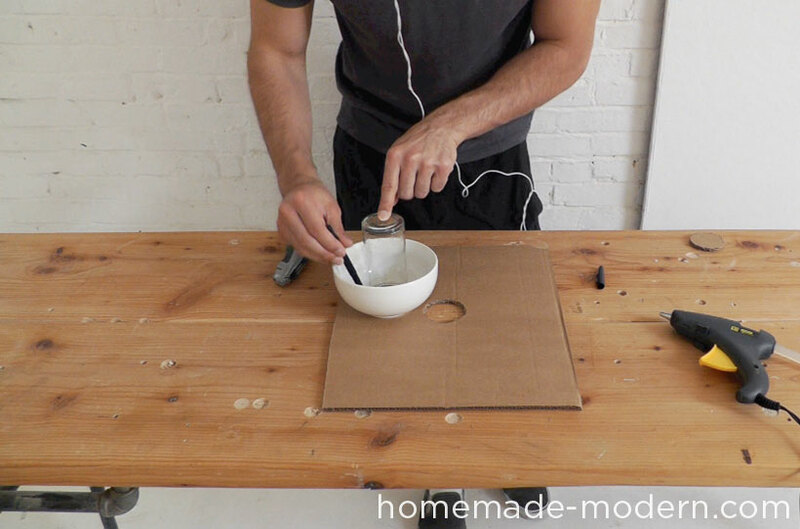 Mix another batch of concrete and spoon it into the second bowl. 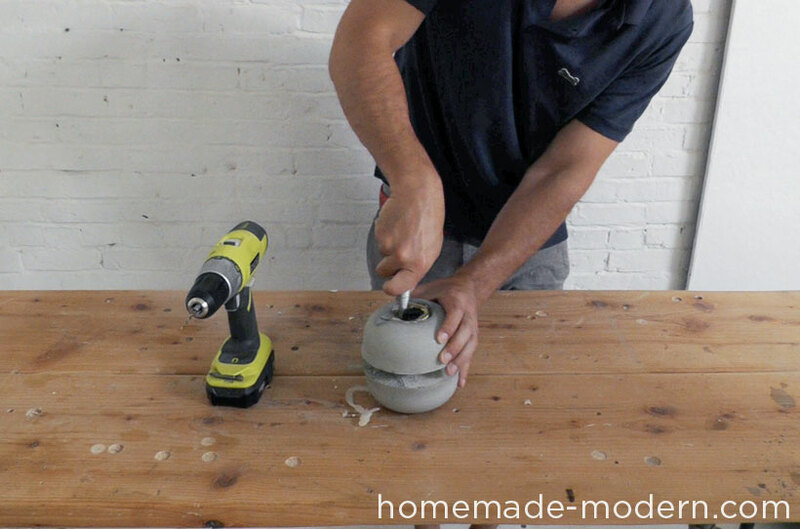 Place the jar into the wet concrete and use a couple of wood scraps to prop it up. 1/2" or 3/4" thick pieces of wood work well. The concrete got a little stuck on the second bowl so I used a hammer and broke the bowl. Use knife to peel and pry off the glue. 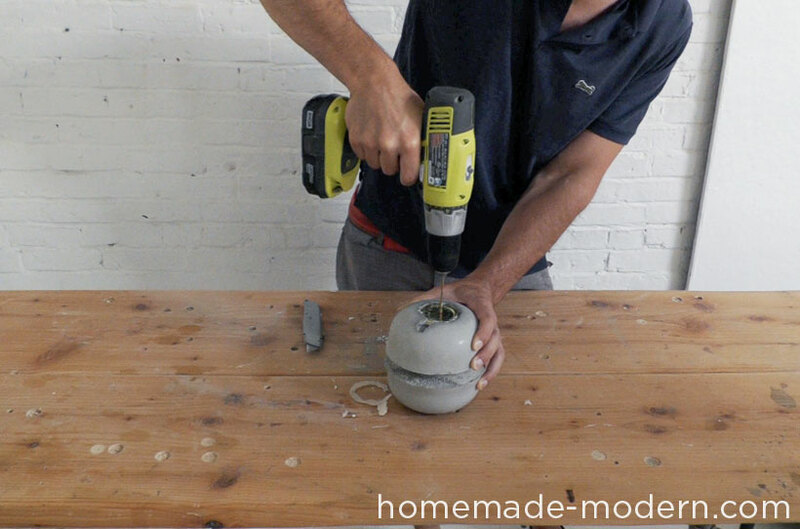 Drill a circle of holes through the lid and then use a knife to cut through the metal in-between the hole. 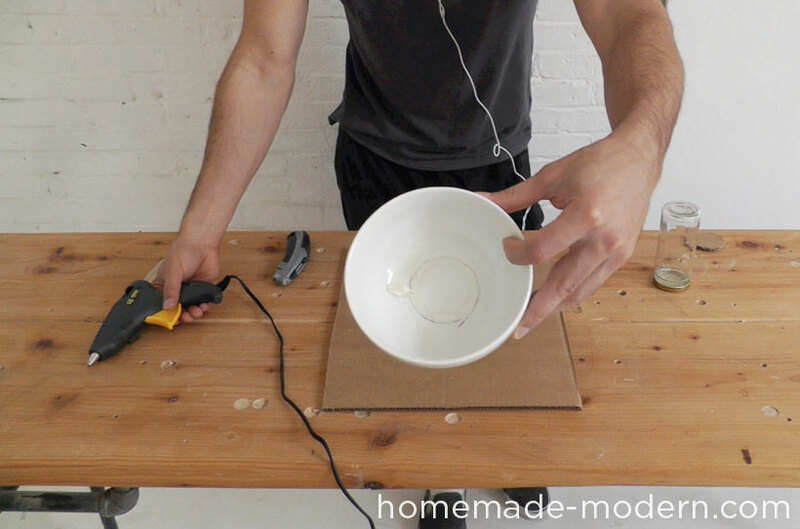 Place the socket and light bulb into the jar and place the cord into the channel created by the line of glue. STEP 13: Turn It On! 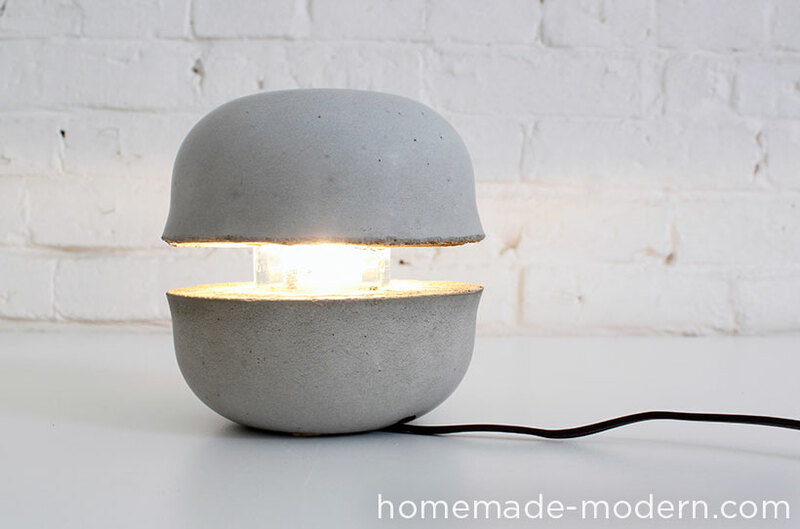 Good luck making your own concrete bowl lamp and please email, tweet or hashtag photos to @benuyeda, ben@homemade-modern.com or #homemademodern. For more detailed instructions, dimensioned drawings and different variations of the project, check out our soon-to-be-released book.